Prepare to be moved! Spring Awakening, which opened at the Community Center Theater on Wednesday and runs through November 15, brings rare vitality to the Sacramento stage. The play offers originality from set, cast, music, and story alike. Make no advanced presumptions. Whatever you imagine the play to be like, youâ€™ll probably be surprised. The story takes place in Germany in the 1800s, yet you could easily be watching a modern drama. The themes are utterly timeless: teenage rebellion against strict parents and stern teachers; new love; curiosity about the body; heartache and hope. In the opening act, female lead Wendla asks her mother how babies are made. She no longer believes in the stork. Her mother scolds her for talking about such subjects and refuses to provide information. Separately, two school boys, Melchior and Moritz share the content of their recent dreams. Moritz is clueless about how his body works, let alone why heâ€™s having such indescribable yearnings. This is a story about teenagers coming of age, awakening to their sexuality. All the while the adults stand prominently and anonymously in the background, glowering over the youth, scolding them for every straying thought and refusing to provide helpful information. The teens are left to learn for themselvesâ€”with utterly tragic results. The emotions in this play run high, cutting to the core of the viewer through powerful song, music, and lighting. Thereâ€™s an electricity of youthful fervor that comes through in rock songs like â€œTotally Fucked,â€ where the cast jump and run about the stage, crawling from ladders and pounding their bodies. The high energy is reminiscent of a rockerâ€™s mosh pit, and the 1800s hairstyles and knickers only add to the enthusiastic punk flare. AndÂ for those who enjoy songs in the classical Broadway tradition, this play offers plenty of those, too. There are both haunting and hopeful melodies sung with theatrical gusto. The band and staging add to the success of this play. Rather than hiding the band in the orchestra pit, Spring Awakening sets them directly at the rear of the stage, lending even more authenticity to the rock quality of many performances. The audienceÂ are also part of the set: bleachers filled with todayâ€™s youth double as a kind of â€œback stage,â€ where actors sit during the performance. Meanwhile, during full cast musical productions, youth from the stage audience stand at their seats to sing backup. All this plays into the timelessness of the show. Hats must come off to the courageous actors in this dynamite play. Wendla played by Christy Altomare and Melchior played by Jake Epstein are a delightful and believable romantic match. Their love scenesÂ are equally sweet and bitter, their yearnings affecting. They both sing like doves in perfect pitch. Meanwhile, actors Taylor Trensch (Moritz) and Steffi D (Ilse) could successfully start a rock band with their sassy stage presence and powerful vocals. The two provide a charismatic and angst-filled match to the romantic leads. 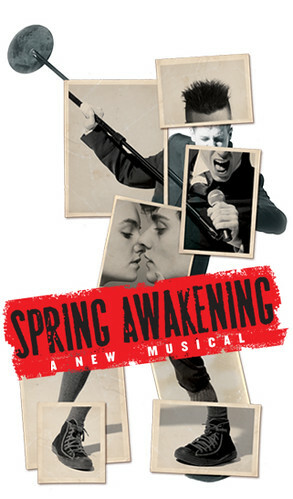 Overall, Spring Awakening is rich, dynamic, and alive with originality.